French company Alstom unveiled the first-ever passenger train powered completely by hydrogen at this week’s Berlin InnoTrans trade show. The hydrogen train or “hydrail” will be put into service on Germany’s Buxtehude-Bremervörde-Bremerhaven-Cuxhaven line in Lower Saxony by December 2017. After two years in development, the “Coradia iLint” train offers a zero-emissions alternative to Germany’s existing fleet of diesel trains, thanks to a roof-mounted tank of hydrogen fuel. The hydrail is an electric train operating with a hydrogen fuel tank on its roof that powers a fuel cell to generate electricity. This train, and others like it to come in the future, are part of a big push to reduce greenhouse gas emissions from transportation. 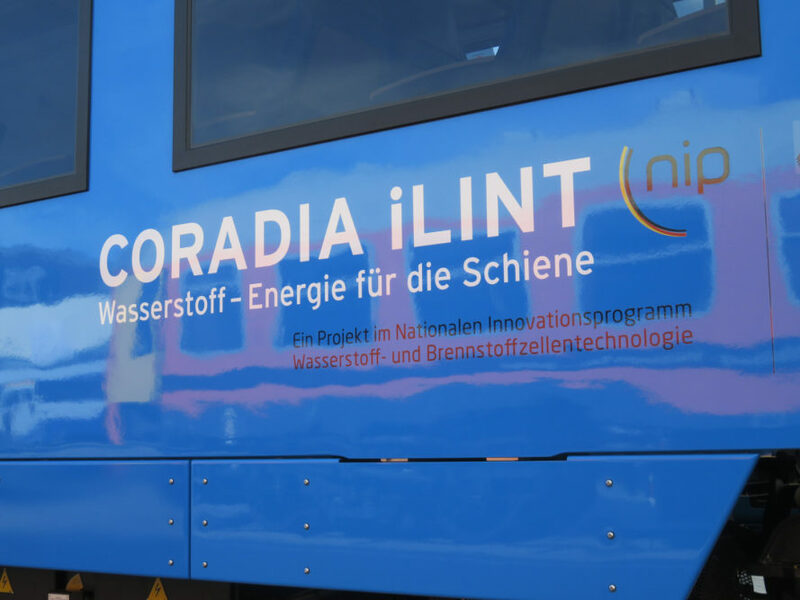 The Coradia iLint will be the first of its kind to carry passengers along the railway, as most other innovations in hydrail technology have been focused on cargo transport. Due to its electric engine, the Coradia iLint is much quieter than traditional diesel trains. In fact, even at its top speed of 87 miles per hour (140 km/h), the only sound passengers will hear comes from the motion of the wheels and air resistance. Although the hydrail trains are reportedly more expensive than existing diesel models, officials in other parts of Germany, as well as in the Netherlands, Denmark and Norway, are interested in bringing the clean running trains to their regular rail services as well. NASA could not provide the most effective refrigeration for their liquid hydrogen tank, so they boiled off some of it at intervals to keep it cold enough to remain liquid. They also could not make thick dense container walls for the liquid hydrogen because of weight constraints when launching a spacecraft. This sounds good, but the numbers don't pan out. Hydrogen is manufactured from electrical energy. Hydrogen electrolysis is a low-efficiency system that loses a lot of energy. (Around 20% efficient in a well-run system.) Burning hydrogen is at most a 40% efficiency system. 0.2 x 0.4 = 0.08. So these are approximately 8% efficient at converting the electrical energy into motive power to the train. Hydrogen is hard to store. Hydrogen leaks from any container because the atoms are so small. NASA used to figure 10% of the liquid hydrogen fuel would evaporate per day. So when you put it all together, by the time it's used, you may use 2%-5% of the electrical energy generated to move the train. That's just terrible energy economics. Back that up into the calculations to figure out the energy payback of the solar or wind farms used to create the power? It's terribly wasteful. This is a window-dressing train, not anything real that will help solve anything. N mention of where they will get the Hydrogen from. If they use the typical source, steam reformation of natural gas, then this train isn't really all that green. Sure the TRAIN is zero emissions, but from Natural gas, the CO2 burden of the Hydrogen will be worse than just outright burning of the natural gas. Germany will be home to the world's first zero-emissions hydrogen passenger train when the Coradia iLint hydrail goes into service in December 2017.